In my latest #tiegrad class I was invited to discus the changing role of the teacher in the digital age. Richardson, W. (2012) understood the changing role of the teacher when he stated, “In this new story, real learning happens anytime, anywhere, with anyone we like – not just with a teacher and some same age peers, in a classroom from September to June. More importantly, it happens around the things we learners choose to learn, not what someone else tells us to learn.” (p. 1). In order to understand the changing role of the teacher in the 21st Century, it is important to consider the historical role of the teacher. For centuries, direct instruction was the pedagogy of the day. The teacher held the position of absolute authoritative power and was the holder, and dispenser, of knowledge. Students worked to achieve curricular objectives designed and assessed by the teacher, and were given extrinsic motivators like grades and rewards as reasons to memorize information and demonstrate understanding of taught concepts. In contrast, the digital age represents an important time of educational change. The role of the teacher is evolving as new, digital, epistemologies form in an increasingly connected and networked world. In classrooms and schools around the globe, teachers are changing their methods to better suit the increased use of digital technologies available in education. Advances in technology have led to a more networked and connected world, and has given rise to a myriad of useful resources. Classrooms today are no longer confined to one specific educational theory, or limited by physical space. Education is no longer just about delivering curriculum in a way to actively engage the student in the room; it is about access to information. Active engagement and active learning have now become interactive learning. Teachers and students now co-learn across school districts, provinces, and countries. They share, collaborate and create information with a simple keystroke, click of the mouse, or via video conferencing available on their mobile devices (Thiele, Mai, & Post, 2014). The changing role of the teacher in the digital age can be characterized by three distinct relationship changes; between teacher and student, teacher and curriculum, and teacher and pedagogy. One fundamental change teacher’s face in the digital age is the change in the teacher-student relationship. According to Lemley, Schumacher, & Vesey (2014), “The 21st-century student will expect the 21st-century learning environment to provide opportunities creating a different role for the teacher” (p.6). In this version of school, the learning environment is flexible and dynamic. Learning is no longer restricted to the confines of the regular school day. It extends to the home, the community, and beyond. Learners prefer not to have education confined to the classroom, but want to have the freedom to be able to learn at any time and in any place (Rosen, 2011, p.5). Another shift between learner and teacher revolves around exploring curriculum together. Learning is a shared experience between teacher and learner. At one time, the relationship between teacher and learner was hierarchical in nature. The teacher was the dispenser of knowledge and communication between student and educator was one-way. That model no longer provides the best learning experiences for students. In the digital age, teachers are learning with their students through co-learning and collaboration. These methods form the basis of personalized learning. Teachers are re-examining their relationship with curriculum and are moving from a teacher-centred perspective to a student-centred perspective. British Columbia’s version of this change in curriculum and pedagogy coined the BC Education Plan. Government of British Columbia (2013) states, “Our education system is based on a model of learning from an earlier century. To change that, we need to put students at the centre of their own learning” (p. 2). A move towards student-centred learning refocuses on the interests of the child rather than others involved in the education process. Teachers are making changes to their curriculum to include periods of inquiry learning. Exploring the path of inquiry learning with students follows a constructivist theory of education. Self-directed in nature, inquiry learning develops critical and creative thinking skills; skills learners will need in order to be successful in the future. Maiers, A., & Sandvold, A. (2010), talk about the importance of student-centred learning in The Passion Driven Classroom. They relate inquiry learning to finding learner’s passions and say, “It will be the passion that students hold, not for every subject, but for the ACT and PRIVILEGE of learning that will allow them to reach rigorous outcomes and excellence” (p. 6). When teachers move curriculum from methods of talk and show to methods of inquiry, they focus on each student’s passions, abilities, and learning styles; thus, allowing the teacher to move from a position of administering to facilitating learning. In addition, when teachers integrate inquiry methods in their curriculum, they honour the importance of student voice and recognise that it is central to the learning experience for every student. In a student-centred classroom, students choose what they will learn, how they will learn, and how they will assess their learning. Student-centred learning requires students to be active, responsible participants in their learning. This aligns with Thiele, Mai, & Post (2014) findings in their research on learning in the 21st Century, “The implementation of technology can enhance learning by making the classroom more active and student-centered”(p. 1). In the digital age, teachers have a variety of tools and resources available to create curriculum with students, invite learners to discover the pleasures of lifelong learning, and open the classroom up to a global audience. According to the Government of British Columbia (2013), “Curriculum will increasingly emphasize key concepts, deeper knowledge, and more meaningful understanding of subject matter, and give teachers the flexibility they need to personalize their students’ learning experiences” (p. 3). Dewey, J. (1929) also realized the importance of student-centered learning in My Pedagogic Creed when he wrote, “The true centre of correlation of the school subjects is not science, nor literature, nor history, nor geography, but the child’s own social activities” (p. 4). Relationships teachers have with their learners, curriculum, and pedagogy are changing rapidly in this time of digital enlightenment. Early educational theorists such as Dewey and Montessori understood the needs of learners and the constraints of curriculum. Digital technologies have allowed teachers to realize the dreams of early educational theorists. Educators no longer need to work in isolation. They have the knowledge and resources to facilitate learning by exploring curriculum with their learners. When teachers revisit their relationships with learners, curriculum, and pedagogy in the 21st Century, they create innovative change to the education system and encourage children to thrive in a dynamic and rapidly evolving world. They accept that students must be at the centre of a more personalized approach to learning and must be given the freedom to pursue their individual interests and passions in the classroom. Couros, G. (2010). The power of working together. The principal of change: stories of learning and leading. Retrieved from http://georgecouros.ca/blog/archives/1020. Dewey, J. (1929). My Pedagogic Creed. In I. D. Flinders & S. Thorton (Eds. ), The Curriculum Studies Reader (pp. 34–43). New York: Routledge. Government of British Columbia. (2013). BC ’ s Education Plan, 1 – 9. Maiers, A., & Sandvold, A. (2010). 1 Achievement gap or passion gap? The passion-driven classroom: a framework for teaching and learning (p. 6). Abingdon, Oxon: Routledge. Rosen, L. D. (2011). Teaching the iGeneration. Educational Leadership, 68, 10–15. Retrieved from http://web.ebscohost.com.libdata.lib.ua.edu/ehost/detail?sid=3dc15bba-9972-4ca4-adb4-892d68f5a898@sessionmgr110&vid=31&hid=10&bdata=JnNpdGU9ZWhvc3QtbGl2ZQ==#db=aph&AN=58108032. Thiele, A. K., Mai, J. a, & Post, S. (2014). The Student-Centered Classroom of the 21st Century : Integrating Web 2 . 0 Applications and Other Technology to Actively Engage Students. Journal of Physical Therapy Education, 28(1). Webb, M. (2012). Pedagogy with information and communications technologies in transition. Education and Information Technologies, 1–20. doi:10.1007/s10639-012-9216-x. Within the context of k-12 schools, I used to think self-regulated learning was limited to regulating the behaviour and emotions of the students; However, thanks to the likes of Phil Winne, Allyson Hadwin, and Mariel Miller I realize it’s so much more. In its simplest form, self-regulation speaks to the skills students need to become independent life-long learners. Phil Winne from SFU Education on Vimeo. Butler, D. L., & Winne, P. H. (2014). Feedback and Self-Regulated Learning: A Theoretical Synthesis. Review of Educational Research, 65(3), 245–281. Perry, N., & Drummond, L. (2014). Helping young students become self-regulated researchers and writers. The Reading Teacher, 56(3), 298–310. Wang, C., Shannon, D. M., & Ross, M. E. (2013). Students’ characteristics, self-regulated learning, technology self-efficacy, and course outcomes in online learning. Distance Education, 34(3), 302–323. What will the future of learning environments look like? Will learners continue to turn up, in droves, at brick and mortar schools where they will be divided into learning groups by age, sat in desks with the teacher and whiteboard as the focal point, compartmentalized by constricting classroom walls, and taught individual subjects within the narrow confines of a curriculum dictated by an educational governing body? Probably not, so are we then on the cusp of radically altering our learning environments to better suit tomorrow’s learners? – Learner’s whose brain physiologies are changing and whose socially connective needs are rapidly evolving. Learning environments transcend the traditional four-walled classrooms and may include books/text, e-learning, resources, relationships/communities, assessments, and physical learning spaces. Simply put, learning environments are physical and virtual spaces or objects that are directly connected to the learning process. Nobody really knows what future learning environments will actually look like, but we know they need to evolve from the current model. In Sugata Mitra’s TED Ed video titled, “Build A School In The Cloud” he talks about the today’s learning environments with reproach. He accurately conveys that today’s model of education is rooted in Colonial British Empire history. A model that was important 300 years ago but not so much any more. This mirrors Sir Ken Robinson’s view of current learning environments in his video, “Changing Education Paradigms.“ Education is a slow institution to change. To better communicate my vision what learning environments might look like beyond today, I thought it prudent to look at the future in two steps – the near future and far future. Collaboration – many teachers have developed their own personal learning networks to deepen their understanding of how people learn. In the same way, learners will be encouraged to develop their own networks. There will be a shift from teaching content to teaching how to learn. Brain science will be explored further with respect to understanding the changing physiology of our learner’s brains. Content will continue to move from analogue to digital and involve highly personalized learning. Learning won’t be restricted to the confines of a traditional six-hour school day. Learners will follow their own paths of inquiry and take advantage of the expanding role of open education. School will need to be resigned into dynamic physical learning spaces. Our current classrooms have changed little in 100 years. Future learning environments will no doubt be exciting and fulfilling and are very likely to be rooted in science and technology. 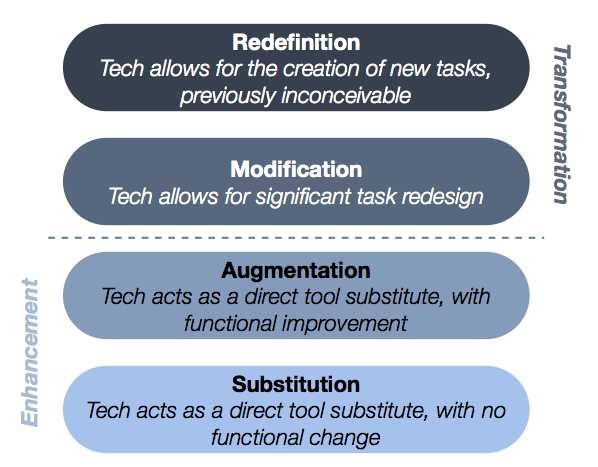 Technology driven – no need for spelling, writing, pens, or pencils in these environments. The evolution of computer interfaces means the end of the keyboard and a shift to cognition form of communication. Science driven – Science will continue to help us understand how learn best and we are sure to maximize this in the learning process. What will future learning environments look like from your perspective? There have been numerous blogs, articles, and websites that have created meaningful dialogue on the topic of the skills necessary for the 21st century learner. As part of my #tiegrad courses, I have been asked to contribute to this topic by adding my own set of skills. I designed this model to help myself make the connections between the people, the content, and skills required for learners in the 21st century. 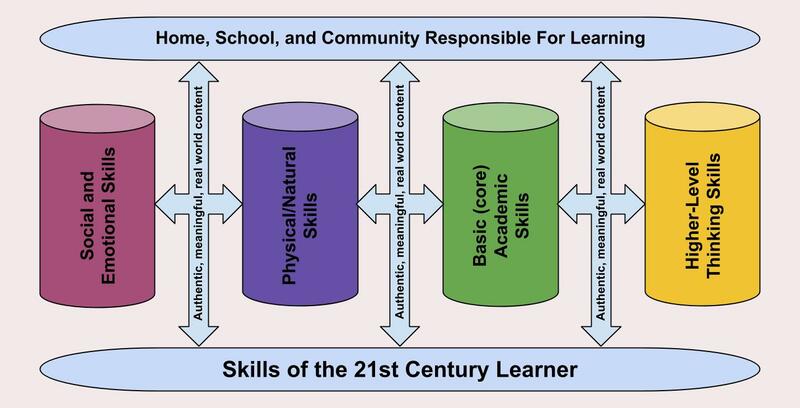 Four skills important for the 21st Century learner that relate to my practice are social and emotional skills, and physical/natural skills, basic (core) academic skills, and higher-level thinking skills. When these skills are supported and practiced by the school, home, and the community, and combined with authentic, meaningful and real-world practice we are preparing our learners to make positive contributions to society. I have written about the importance of social and emotional skills in learning before. As we become more connected in a technology sense, we become less connected in a face-to-face sort of way. The skills required to be successful in the real world involve collaborating and problem solving with others. Humans are far more productive and effective when they work together in groups consisting of people with different strengths and not independently. The 2008 CASEL report, The Positive Impact of Social and Emotional Learning for Kindergarten to Eighth-grade Students emphasizes the importance of these life skills and their direct correlation to academic success. A 2013 Maclean’s article titled, Early education: this is not a field trip reports on a pilot kindergarten program designed to exposed young children to the wonders of nature. With “90 per cent of Canadian children are gaming and six out of 10 households have a gaming console” there exists evidence that children are not spending the same amount of time playing outdoors as they once did. Children who do not engage in active play outdoors don’t learn to socialize, share, and problem solve in the same way children who are in touch with nature do. In my experience, students spend entire weekends playing video games, and rather venture outside to play. A healthy balance between indoor and outdoor play has been lost. We need to develop, in our learners, the ability to use the technology that exists at their fingertips today, the technology that will be developed in the future. I genuinely believe we need to be raising a generation of socially conscious learners who, through the use of technology, can make the world a safer and healthier place for generations to come. By facilitating the learning of higher-order thinking skills such as problem solving, critical thinking skills, a sense of inquiry, comparing and identifying ideas, and using old concepts to create new ideas, we can encourage our learners to innovative. The basis of robust learning design focuses more on what learners can do with knowledge and not how much knowledge they can retain. In summary, there are many skills that are useful for today’s learner. You may or may not agree with the importance of these skills I suggested or how they relate to today’s learner, but in my experience and based on the 9-11 year olds I work with, these are important skills. When learners have a strong support network, when they engage with content that is relevant and meaningful, when they are allowed to follow their own paths of inquiry, and have their physical and emotional needs met, they take a step closer to becoming lifelong learners. What skills do you think are necessary for your learners now and in the future? In my #tiegrad class, I was recently asked to consider whether or not our current schools/teachers/curriculum are preparing students for the 21st century? I think it’s fair to say that schools, teachers, and curriculum want to meet the needs of their learners regardless of the century they occupy. They want to produce independent thinkers who contribute to society in positive ways, and learners who are encouraged to reach their full potential. Probably not, but it isn’t from lack of trying. Everyday I am surrounded by deeply passionate educators, who deliver curriculum in meaningful and innovative ways, work hard towards building robust relationships with students, in districts who desperately want to see successful children arriving at school doors every morning. In order for curriculum to meet the needs of its learners it cannot be revised every 4+ years. It’s in the area of curriculum where I find educators excel, and the work they do is sometimes under appreciated. They have become extremely skilled at using curriculum as a guide before tweaking, contorting, and manipulating its content to make it relevant for their learners. I don’t know a single teacher who isn’t working their socks off at making curriculum relevant. It might not follow current ‘trends’ in education but who’s to say that it’s not meaningful to the group it’s being shared with. By now it is unquestionable that our current education system was designed for a different era, and needs an overhaul. Learners grouped by age instead of interest/ability, sat in desks for the majority of the day, learning a compartmentalized curriculum, and primarily focused on individual success and recognition. The world is moving in a different direction and education is in danger of being left behind. If our current education system operated in the business world, then it would have folded long ago. In its defense, there isn’t the kind of money allotted to make the kind of sweeping changes that occur often in the corporate world. Schools are asked to do more with less and strain is clear to see. When high schools are so overpopulated that PE teachers are required to conduct their lessons in the hallways then there is an obvious problem. Perhaps there are too many individual groups (Ministry of Education, school boards, school districts, DPACS, principals, parents, union, and teachers) within the system trying to advocate for their own methods of reform, that it is difficult to hear the message through the noise. The British Columbia Ministry of Education is in the process of revising its curriculum through its much-touted BC Education Plan. Will it be enough? Only time will tell whether it will support those asked to convey its new vision of a changing world and changing learner. I agree with the BC Education Plan’s message that student’s need to be at the center of their learning. In fact, the more I read about student centered learning from the likes of Angela Maiers’s The Passion Driven Classroom, Will Richardson’s Why School, and Daniel Pink’s Drive, the more I realize the importance of learner choice in education. Learners need time in their weekly schedule to find their passions and follow their own learning path. I particularly enjoyed watching Shelley Wright’s TED Talk about the power of student learning. In it she talks about a pedagogical awaking under the guidance of Alex Couros. “For the first time I began to realize that maybe my students could construct their learning. That learning is constructed in community, and that maybe they would be the centre of it, maybe they would have something to say about it.…” Shelley Wright. Student centered learning promotes lifelong learning, stimulates creativity, fosters a healthy sense of inquiry, and leads to increased engagement in the subject matter. As I continue to shape and reshape my own pedagogy through the experiences I have at school, my own lifelong learning, and the professional networks I have developed, I have come to realize certain facts about learners in the 21st Century. I know that curriculum needs to be relevant and meaningful to its users. I know that learners need time to follow paths of inquiry, and be encouraged to take risks. I know that the social and emotional needs of my students need to be met before any learning can take place, and there is a unhealthy fear of failure in our schools. Most importantly, a robust, flexible, and rigorous public education system is more important than ever. Does Design Thinking Have A Place In Education? In my latest #tiegrad course I have been tasked with better understanding design thinking, and to consider whether it could play a relevant part in my own instructional design process. I wanted to share my initial findings as I seek a deeper understanding of the process. If empathy, interpreting, imagining, planning, and testing are the principles of design thinking, then it is remarkably akin to the assessment cycle used in education. They are both user centered, continuous, and intentional. Perhaps design thinking is the new assessment cycle? Regardless of your thoughts of the process of creating engaging, authentic, and relevant instruction in your classroom, I believe design thinking has a place in our education system, classrooms, and schools. If “Design has a set of tools and methods that can guide people to new solutions.” (Nussbaum, 2009) and mainstream public-school education in Canada is having difficulty understanding the needs of the latest entrants into its system, then surely we can borrow some ideas from design thinking to inspire a new generation of learner. I will be the first to admit that I struggle to consistently design learning experiences, which engage all my students. I struggle with student apathy towards education, and I seem to focus so much of my day developing and maintaining relationships, understanding my learners, and meeting their socio-emotional needs that my current assessment practices need redesigning. Can the design thinking cycle help? I’m not sure yet, but I am certain that more time I spend with my learners working towards authentic, real life learning experiences the more engaged my class is, and the more satisfied I feel. I see design thinking working across the curriculum. In social studies, design thinking is idea for addressing many social justice issues such as hunger, education, poverty, and unclean water. These global issues need a new approach and creative solutions. The collaborative nature and user-centered approach of design thinking can help. This PBS documentary shows design thinking at work by highlight the work done by Stanford University’s Institute of Design (aka the d.school) students who created products that may save thousands of lives in Bangladesh, Indonesia and other developing countries they visited. My learners are concrete learners. How do we teach creative fluency, flexibility, and originality, when these qualities may not be supported/valued at home? This post marks the start of a new educational related journey for me. I’ve decided to go back to school and further my understanding of the best practices available to engage and motivate my learners. I’m part of a small cohort #tiegrad and our first assignment is to create a media clip based on our educational interests. I get it! It makes sense to me, but I still wonder what it looks like for all my students. I am looking forward to reading Angela Maiers, “The Passion-Driven Classroom” which I believe speaks to this type of learning. Another area of interest to me is self-regulation. I work in an inner-city school with a disproportionately high number of at-risk children. Many of these children are either too stimulated or not stimulated enough to partake in the learning process. The need to develop students’ ability to self-regulate has become glaring obvious to everyone who works in my school, so this year I’m working with a new program called MindUP curriculum developed by the Goldie Hawn Foundation. MindUP teaches social and emotional learning skills, brain science, a positive mindset, and mindful awareness. Right now we’re working on deep breathing techniques, and will soon be learning about important parts of the brain, and how signals in our brain get blocked during times of stress and over stimulation. I‘m an avid Twitter user and have found real value in Twitter over the years, particularly when developing learning networks, making connections, and working to improving my craft. I like to explore student-learning networks in more depth. The thought of my own students making connections with other students, teachers, professionals from around the world who work in fields they are interested in excites me no end. I’ve tried them with students with mixed success but never with a whole class. Game-based learning is an area of education that fascinates me. I’ve just finished reading Now You See It by Cathy Davidson and in her books she talks about designing lesson in a gaming format where lessons allow for risk taking, meaningful creation, nonlinear navigation, problem solving, and an understanding of rule structures So many of my students play video games and are engaged, motivated, and incredibly creative with them. Nothing would please me more than to transfer some of those experiences into the classroom. Finally, I have to let you into a little secret. All the areas of professional interest I’ve mentioned already pale in comparison to what gets me up in the morning. Four years ago I took my grade 6’s to Free The Children’s We Day in Vancouver, and that one experience change my views on education and what’s really important in school. Building positive healthy relationships with one another, exercising tolerance, forgiveness, and above all else caring for one another is what really matters. Thanks to We Day, my classroom has become a hub for social justice issues both globally and locally. We fight hunger, stand against inequality, educate our local community about homelessness and water issues, and advocate for human rights. I look forward to learning and sharing with you.